Remember back in the Summer of 1997 when Barry Sonnenfeld's Men in Black hits screens? Sure, the film was a lot of fun, but it was also a lot like Ivan Reitman's Ghostbusters, only with aliens standing in for the ghosts. Fast forward 16 years and its Sonnenfeld's adaptation of Lowell Cunnigham's comic that is being rehashed, this time transplanting aliens with the undead and Will Smith's rookie cop with Ryan Reynolds' recently gun-downed law enforcer. 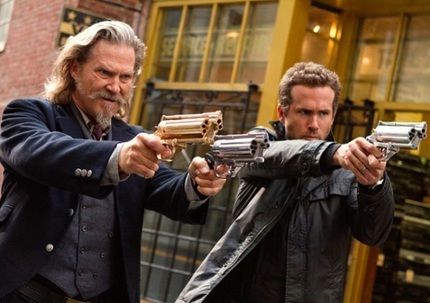 Other than that, everything seems to be almost exactly the same, with Jeff Bridges taking on grizzled veteran partner duties, as stetson-sporting gunslinger Roy Pulsipher, in R.I.P.D. (an acronym for Rest In Peace Department - clever, right?) from Red director Robert Schwentke. Again the source material is a comic book, this time penned by Peter M. Lenkov, but nothing about this looks new or original. Sure, it could be fun - despite its menagerie of CGI zombies - but on the basis of this trailer, expectations are not high. Not having read the source material, I actually wonder if this movie will even touch on the subject of multiple types of afterlife... maybe that's hoping too much. Two white guys whose alter egos are a woman and an elderly Asian man! I am sure that juxtaposition will be handled with wit and skill, and not be horribly insulting to anyone. "Fast forward 16 years and its Sonnenfeld's adaptation of Lowell Cunnigham's comic that is being rehashed, this time transplanting aliens with the undead and Will Smith's rookie cop with Ryan Reynolds' recently gun-downed law enforcer." Yeah, you could say that Mr Marsh, or......."instead of Joe Piscopo & Treat Williams in Dead Heat (1988) I get Jeff Bridges looking like Colonel Sanders.....?" Really...I shouldn´t complain.......never was a fan of Dead Heat (1988). "Sure, it could be fun - despite its menagerie of CGI zombies - but on the basis of this trailer, expectations are not high." Well, it looks generic.......but hey, James Hong is in it.......could be entertaining. Thanks for the trailer Mr Marsh.